Any old wires would do, as long as they conducted electricity I was happy. I had been informed at a very young age that the invisible energy that came out of the socket in the wall was very dangerous and that misuse could kill me, but I was never instructed not to play with it. By the time I was thirteen or fourteen I knew all about how to connect things to make them work and was mad keen on radios, record players and tape recorders and was constantly wiring up sound systems in my bedroom using ancient speakers from old televisions and defunct radios. I suppose I had a bit of a head start really as my father was very keen on restoring old televisions and radios and would buy them up cheaply from a local dealer. For years our family was kept going with televisions that my father had rebuilt! By the time I was fifteen I was also experimenting with music created electrically. I had discovered that a taught copper wire twanged in close proximity to a magnetic source device produced a sound – yes, I had invented my own electric guitar. This first model was very crude with two strips of plywood screwed together for the neck and a hardboard fascia screwed to the surface at one end and the whole construction covered in Fablon, a sticky-backed plastic from Woolworths. The strings of copper wire were held taught by screws and the pick up was the innards of a headphone. The second incarnation of this was a little more sturdy but still constructed in the same way. By now though I had discovered I could buy guitar parts in the local music shop so invested in a few machine heads and strings. Frets were made out of brass curtain rail cut down and slotted into the plywood neck. 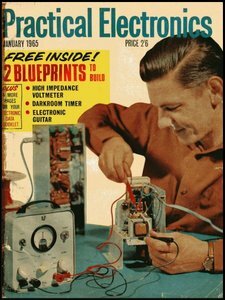 In 1964 a new magazine for electronic enthusiasts was launched, called Practical Electronics, it took no time at all to persuade my father we should have this on a regular basis, so his Practical Wireless was substituted for the new journal. The magazine was full of enterprising and interesting ideas for electronic enthusiasts but my pulse raced when I read in December that the January 1965 issue would contain a blueprint and construction details for an electronic guitar; I just couldn’t wait for this issue to come out! And so it came to pass that my father and I started to construct an electronic guitar; actually, it was more my father’s input than mine, but I did get to do the hard work like sanding down and the waiting. The waiting was the hardest part of all, I was itching to get my hands on this machine and learn to play, I already had an amplifier waiting which I’d built from the innards of an old record player. In May we had got to the spraying stage; I know it was May as it was hanging in the kitchen at the time of the Golden Wedding Anniversary of my grandparents and my famous musician cousin who was visiting that day said he thought the size and shape was alright, but wasn’t madly keen on the colour. I had chosen bright blue, mainly because I didn’t know any guitar manufacturer that made blue guitars at that time. All the metal parts on the guitar were purchased from the local music shop, the finger plate decoration was formica cut to shape to resemble the guitars used by The Shadows. Just before the guitar was completed I had a very stupid childhood accident, all my own fault, and crushed my index finger on my left hand (I’ll tell you how another day). This was quite a serious injury and took months to heal and consequently I started to learn to play using only three fingers, my index finger bound tightly in a splint-like bandage. I always maintained this was one of the reasons I never went on to reap financial rewards from my playing, as I had to relearn everything when my finger was healed. In reality, of course, I was just an average strummer. 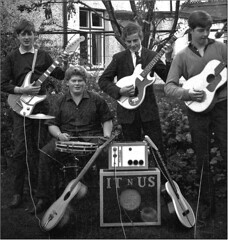 I did get into the school pop group though, and the photo here shows it! Practical Electronics was also responsible for my father constructing me a fuzz-box for the guitar, probably not the most successful project, and then a large guitar amplifier with two twelve-inch speakers. It ran on massive transmitter valves and generated enough heat to warm up a small house on a winter’s day. Later, my brother continued to use this amplifier and always had a large stock of 807 valves as it kept burning them out. It probably won’t surprise you to know I have all these items still as well as the blueprint for the guitar! Love it. You and your father were so much more adventurous than me. I got into electronics later and still regard myself as an expert with a soldering iron. Maybe one day I’ll record my other rock band who did actually get as far as a public performance. One thing I never really mastered was the soldering iron, my father was always following behind me to cure dry joints and eventually I drifted away from that sort of electronics, it was the same when I went into a welding phase in the 1980s, never really got to grips with that either! Welding – that’s altogether much harder. I couldn’t solder as a kid. My dad used to despair of me. In my first teaching job I watched a superb technician at work with the iron and never looked back.